"Amen! Glory to God for His Victory He has given us!!" "'O, Lord, hide thy word in my heart, that I might not sin against thee." Psalms"
"Amen,first-accept that you are a sinner, then, have faith or believe in our LORD JESUS CHRIST,and then, commit yourself, call upon HIM, or confess HIM as your Saviour and Lord (controller)..."
"KJV is the only way to go in Bible Study." "Who knew the simple faith, of a child of God, could overcome the world? It's incredible for me to think and know, that someday our faith in the Lord Jesus Christ WILL overcome this world completely and eternally, when we stand by His side. Not only in heaven, but on this very earth as well! Can't wait for that day!" "Lord Jesus, give us your kids this overcoming faith because we need it now more than ever in these last days, Amen." 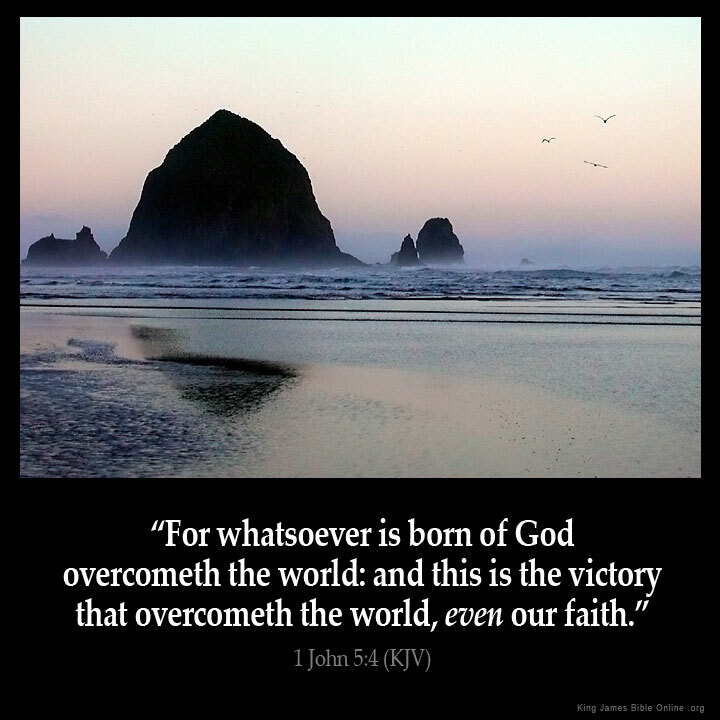 "1 JOHN 5:5 Who is it that overcomes the World? only HE who believes that JESUS is the SON of GOD. amen.!!!" "If you are in Christ, expect to overcome. With God, nothing is impossible." "Amen, we were born into this victory on our second birth! Rom 8:37 But in all these things we more than conquer through Him who loved us. PTL!" "Amen. Praise honor and glory to the almighty creator of all." "Haystack Rock, Cannon Beach Oregon." "I sometimes forget who I am and let the world get me down. I forget that I am a child of God and he has control over all things and that I have Victory through him over all things !! Praise him Praise him Amen Amen! Wheu"
"Mi faith is a weapon against th world,i wll over cme by mi faith"
"Satans aointing on earth may be money. But we are anointed to be with Jesus. amen"
"We were formed to be a part of God's family . We must learn how to love and relate to others." "God blesses those who work for peace, for they will be called the children of God. Mathew 5:9"
"Gods creation is so beautiful"
"KJV, the ONLY bible where God is the author!!!!" "Praise God! I'm an overcomer through Him!" "Woooop woooooop! what an encouraging verse!" "Amen! We are not conditioned by the circumstances this life sometimes throws our way, though they still affect us. But our motivation, strength and objectives emanate from the word of God alone. And knowing that our God cannot tell lies, we renew our strength as we keep focused on God�s promises. With that we shall overcome the world through Jesus Christ our lord and savior." "AMEN,IAM PART OF THIS, I HAVE OVER COME DE WORLD AND D DEVIL." "Beautiful picture. What an amazing God we serve." "Every victory that I have is because of Jesus!!!!" "Faith de greatest ingredient!with it we can conquer all tis"
"How wonderful You are Lord"
"I Corinthians : 11 : 8, 9 : " For the man is not of the woman ; but the woman of the man. Neither was the man created for the woman, but the woman for the man. "" "I love that hymn, "Faith is the Victory."" "If you don't know me by now, you will never know me....in the sense, that I have to speak truth. Sometimes, its hard, and I may even sound harsh, but I know what Gods word says, and I know, truth. By His holy word. So if this offends you, take me off of your list. Or groups. I am not trying to be a people pleaser. And I am certainly not judging anyone. That is not my job. Though I may love you all. But I am very concerned, for the body of Christ. I am concerned, because God does not change, we change. We cannot change His word, and try to justify it. It has curses, if it is not used properly. I have a burden of sorts, that people are being deceived, by the enemy, and by using Bible versions, that are watered down, and are no longer holy. Anointed. They are being deceived. Because the scriptures have been compromised, contaminated. I will be speaking this truth, from time to time. As God prompts me. I do have fear of God. I will not argue or debate this, as I share it. I will try to show you scripture, but if your intention is to argue with me, I will not. So, just know....IF THOU WILT NOT OBSERVE TO DO ALL THE WORDS OF THIS LAW THAT ARE WRITTEN IN THIS BOOK, THAT THOU MAYEST FEAR THIS GLORIOUS AND FEARFUL NAME, THE LORD THY GOD. Deuteronomy 28:58. Read the King James, and do searches, on His word, yourself. I love you all in Christ." "If you want God's blessing on your life, and you want to be known as a child of God, you must learn to be a peacemaker." "Its so easy to sound holy but read 1 Cor 12 followed by 1 or 13"
"Love not the world neither the things in the world, because loving it can distract you from the one that created the world. Love God, he is love." "So true and beautiful. Amen." "Take the word an put it in you! get it off the pages an the word becomes life!!" "That is a picture of Hay Stack Rock in Cannon Beach, Oregon. I know because I have stood in front of it." "Thrz no such currency lyk faith in ths wrld coz wit faith we get wat we want and ovacum ths wrld"
"We are blessed to serve such a loving GOD!!" "Yes i am an overcomer ooooooh! thank you Jesus. Amen"
"1John5:20 is the TRUTH that sets christians free from the evil spirit of DENOMINATIONALISM." "All de victory i have is in jesus christ"
"Amen Praises to Jesus for his precious word. To me his word is life is food for my Spirit makes me want top be closer to Jesus Aleluya"
"Amen thank you Jesus hallelujah"
"Amen! Glory to God glory to Christ Jesus......"
"Amen! we are more than conqueror! we've won the VICTORY w/ JESUS!" "Amen....no matter how tuff it gets keep looking forward because the end is so worth it." "Amen...thank You Father for victory & faith...WOW!" "Arent we born of God wen we repent n gv our lives to Jesus Christ?" "By loving GOD and caring out his commands"
"Dat is it. Thank you lord"
"Even our faith...nothing else! Thanks be to God." "Faith is the victory that overcomes the world." "Faith is the victory we know that overcomes the world ! :)"
"Faith is the victory. Faith is the victory. Oh glorious victory that overcomes the world! (Amen!!)" "For we are more than conquerors through Jesus Christ"
"For we are overcomers of the world." "God will interpret HIS WORD, thru the Holy Ghost. I think there's a Word for that!!!" "Greater is he that is in me then he that is in the world"
"Guide us in ur way my lord amen." "Hallelujah! Praise God! Thank You Lord!" "Hallelujah.. You are worthy O God to give for all our Preaises!" "He is able mighty is him"
"He that wait upon thy lord shall renewed their strength,they shall mount up their wing like eagles............ISAIAH 40:31"
"I am a Victor by faith"
"I'm a victor and the enemy will continue to fail on my life, amen"
"Im an overcomer in Jesus." "Majesty,and people say there is no JESUS.WATCH THE "CREATION CALLS "VIDEO." "Mapalad ang mga taong ang DIYOS ay ang PANGINOONG JESUKRISTO, hindi ito kahoy, di rebulto't di larawan, mapalad ang mga taong kilala na ng lubusan itong ating BUHAY na DIYOS ng mga diyos na pinaglilingkuran." "Mr Harry Allison, could you imaging how some people were going out to make money while lying to the people that there is no Jesus. Learned people like the Apostle Paul and Dr. Luke all lived and died in what they knew to be the truth. Then, come the twenty first century some failures in their fields will be exploiting the feeble minds? I do not have anything against them (2Corinthians 4:4)"
"Rejoice in the lord jesus christ and you will be saved and forgiven of all sins we are so happy has christians we are blessed in the name of christ . BLESS HIS WONDERFUL NAME AMEN"
"River flow from the thron of God"
"Scripture must be our faith and practice.."
"So faith overcometh the world!? cul!" "Thank u Jesus 4 ur wrd so sweet." "Thank you Lord Jesus for ur blood coz we born of God through the precious blood of the Lamb! We thank you Lord!" "The Lord Jesus Christ is born of God, we are a part of him and that is how we overcome the world today." "To God be the Glory forever and ever Amen!" "Tru that.. AMEN i guess i should of said 1st.. sorry." "Victory is in Christ . i love Him .Amen"
"We do have the victory in our Lord, with our Lord! Amen!" "We, the believers bro. & sis. of this world!" "What you said was quite good." "Who shall saperate us frm the love of god (Romans says)"
"Yes I'm an overcomer. Thank you Jesus"
"Yes LORD my sole say yes"
"You are so sweet lord"
What Do You Think of 1 John 5?